We offer this complete and effective business tool to route, code, approve and upload Accounts Payable (invoice & Requisition/PO) documents and data in an effective, efficient and inexpensive manner. Only 50¢ per invoice or PO and unlimited users with the standard version. Know invoice status real-time. Imagine no more lost invoices! It is truly a collaborative, interactive and highly visible process. You have a single source of data. No worrying about who has the latest information - everyone has it. Extensive logging and comment is used and available throughout entry, coding and approval processess. Invoices are always visible and searchable by staff. Lost activity is eliminated by the very nature of the process. Source documents (scans, PDF, Text, etc) are saved to cloud storage by application processes. Electronic documents / scans used for primary documentation are uploaded to cloud storage and viewable throughout the application. Likewise, associated and ancillary documents such as requisition, receipt, labor and material documents can be uploaded to the repository and associated with an activity and therefore become visible to all parties to the coding and approval process. Documents stored by the application are also accessable by common cloud storage client applications. Now fully mobile enabled - should you have a need, or just a hankering, to use your phone to crunch a few numbers! You can do everything with a phone or tablet that you can with a desktop device - viewing documents (primary and attachments), coding (g/l) and approval (approve, reject, redirect) - another release from the office tether. The process is structured, comprehensive, complete and effective. Scanned documents are uploaded to a process queue in cloud storage (can also source from your local machine). Meta-data is applied by the staff - including approval routing and initial coding. Approvers change the coding if necessary and approve, reject or re-direct the invoice. Once all approval requirements are satisfied the data is available for uploading to your back-end system. Comprehensive coding & approval tools, rules and template options. 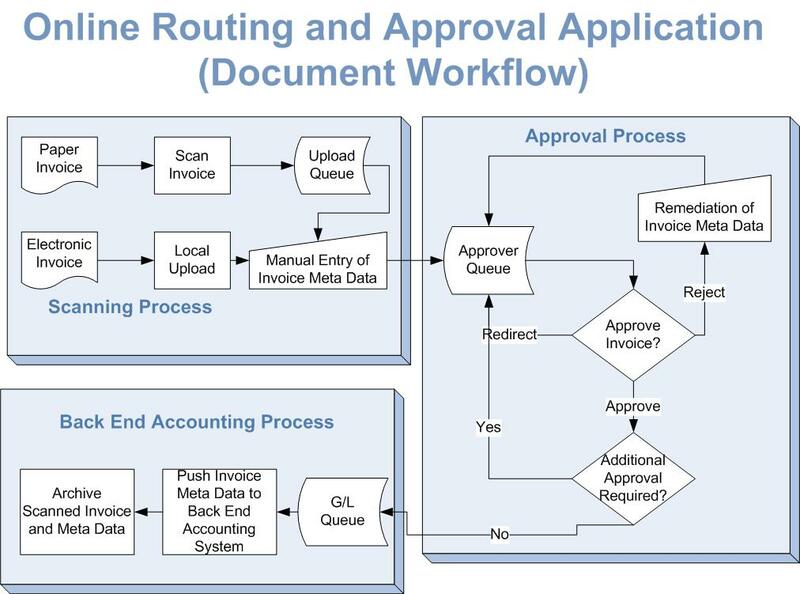 Approval routing is largely automated once data is entered/submitted and can be scaled to as many levels and be as complex as you need it to be. Templates can be created to default G/L coding and approval routing to maintain work/company rules and simplify recurring needs and generally simplify the process. Granular user, access rights and approval management built-in. STANDARD - Use CSV files to sync both account (look-up) data and entered data via an intermediate media (cloud storage) - it is well supported by most ERP (back-end accounting) systems. That may sound foreign or difficult or time-consuming - it's really quite easy to do and quick to accomplish - you and your staff will be accomplished at it after the first few times using this method of syncing. You already have an accounting system, we leverage that for you. ENTERPRISE - Account (look-up) data can be queried live and valid and approved data collected in ORAA can be uploaded to your back-end system on demand. Pre-proccessor or other intermediate tables existing in your back-end system to receive external data uploads are used by default to upload ORAA data. Note - availablilty of live querying depends on the type, access and availability of your back-end system. Reduce process time and costs for you and your vendors with the self-service vendor portal. Vendors submit invoices by uploading a PDF file and entering basic meta-data, saving time and money for both you and the vendor. AP staff then accepts invoices uploaded via the portal and starts them on the coding and approval routing or rejects back to the vendor for revision. The portal also provides vendors with real-time invoice status, reducing vendor queries and saving AP staff valuable time and money. Speedier invoice processing leads to fewer late payment penalties, increased opportunities for early payment discounts and happier vendors. Standard Pricing - 50¢ per invoice or PO - unlimited users - no additional fees.